Contest ends Friday, November 29, US entrants only please. (Please remember to follow me if you aren’t already, otherwise you won’t be eligible to win). Sir Paul McCartney just release a new live record entitled Good Evening New York City, I’m giving away a copy over here. Starting on December 8, 2009, The Beatles will sell their entire digitally remastered catalogue on a limited edition USB stick that looks like an apple. Click here to preorder. The albums have been re-mastered by a dedicated team of engineers at EMI’s Abbey Road Studios in London over a four year period utilising state of the art recording technology alongside vintage studio equipment, carefully maintaining the authenticity and integrity of the original analogue recordings. The result of this painstaking process is the highest fidelity the catalogue has seen since its original release. 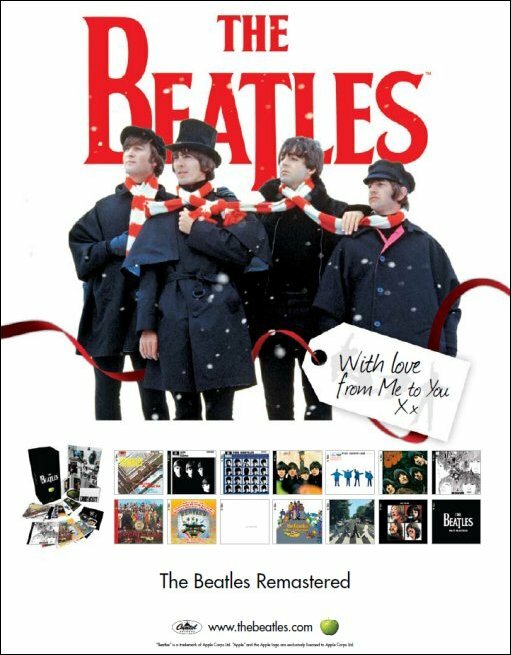 The collection comprises all 12 Beatles albums in stereo, with track listings and artwork as originally released in the UK, and ‘Magical Mystery Tour,’ which became part of The Beatles’ core catalogue when the CDs were first released in 1987. In addition, the collections ‘Past Masters Vol. I and II’ are now combined as one title, for a total of 14 titles over 16 discs. This will mark the first time that the first four Beatles albums will be available in stereo in their entirety on compact disc. These 14 albums, along with a DVD collection of the documentaries, will also be available for purchase together in a stereo boxed set. Within each CD’s new packaging, booklets include detailed historical notes along with informative recording notes. With the exception of the ‘Past Masters’ set, newly produced mini-documentaries on the making of each album, directed by Bob Smeaton, are included as QuickTime files on each album. The documentaries contain archival footage, rare photographs and never-before-heard studio chat from The Beatles, offering a unique and very personal insight into the studio atmosphere. A second boxed set has been created with the collector in mind. ‘The Beatles in Mono’ gathers together, in one place, all of the Beatles recordings that were mixed for a mono release. It will contain 10 of the albums with their original mono mixes, plus two further discs of mono masters (covering similar ground to the stereo tracks on ‘Past Masters’). As an added bonus, the mono “Help!” and “Rubber Soul” discs also include the original 1965 stereo mixes, which have not been previously released on CD. These albums will be packaged in mini-vinyl CD replicas of the original sleeves with all original inserts and label designs retained. My daughter would love this. I tweeted about the giveaway. Great contest. Thanks for the chance. wow, are they still bigger than jesus during on his birthday . . . i eat beatles music . . . yeah, yeah, yeah! My mom have one thing we share, we Love John Lennon!! Pick me to win!! I follow you on twitter and tweeted…what a great prize!!! Thanks from a HUGE Beatle fan! Beatles are the best!! Named my son Julian…John Lennons sons name. Back In The USSR? Throw my name into the contest for sure. I’m old enough to remember the Beatles, and as a 5 year old, to have gone about singing “I love you yeah, yeah, yeah”. Therefore, too old to know how to “follow” someone. Hope you will enter me anyway because I have a 7th grader who is “doing” the Beatles in art class — whatever that means and would like the poster for him. Great prize, I just have to figure out where to hang it. I love this poster. Thanks for the giveaway.